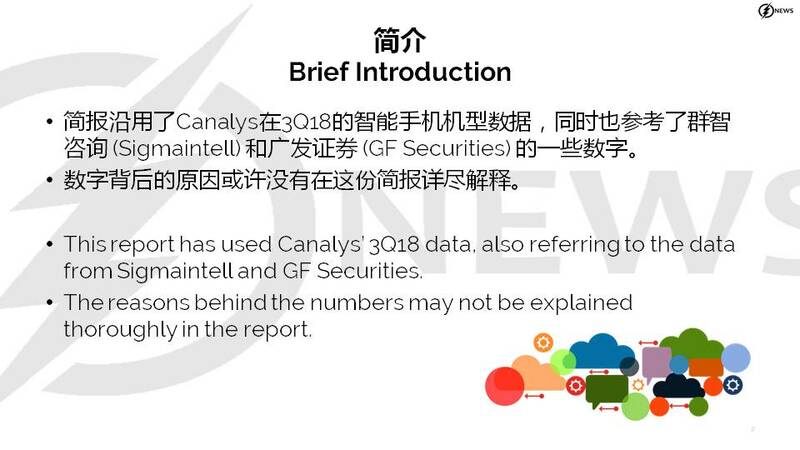 This report has used Canalys’ 3Q18 data, also referring to the data from Sigmaintell and GF Securities. 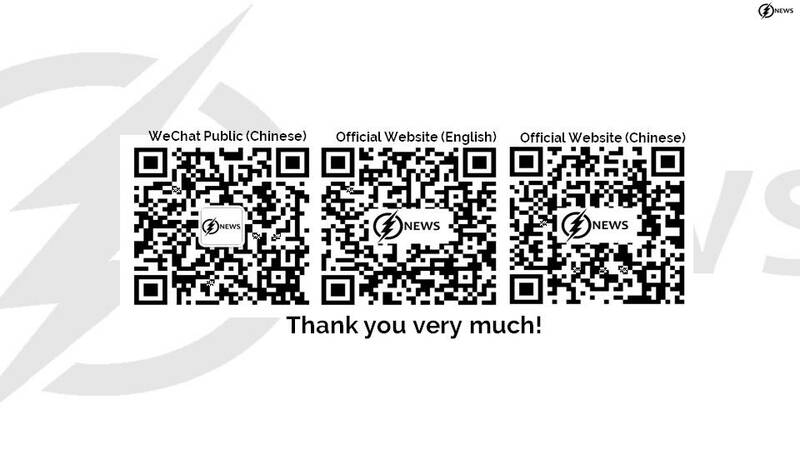 The reasons behind the numbers may not be explained thoroughly in the report. Apple iPhone 8 is still the most shipped phone globally in 3Q18 with more than 8.70M units. Apple iPhone 8 is most popular in the matured markets NA and WE. Samsung Galaxy J series is well-received in LA, CE&E and ME. Xiaomi’s Redmi 5A, which is launched in end of 2017 still leads the APAC market, but it is followed closely by OPPO A3s (launched in Jul 2018). 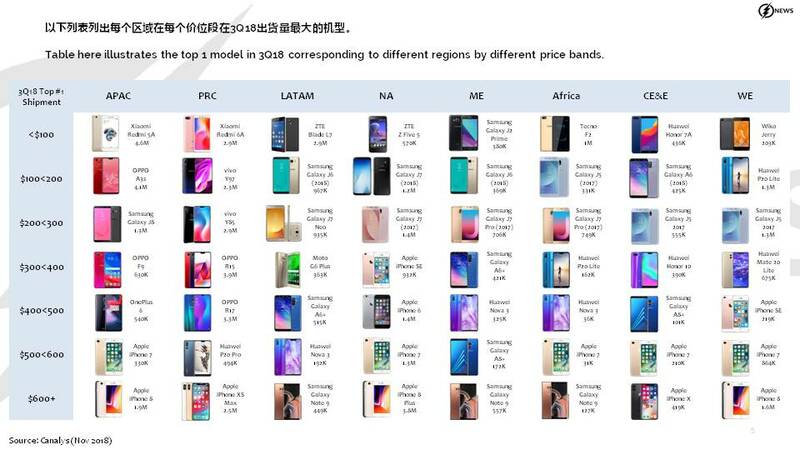 In PRC, OPPO and vivo models own 8 seats in the top 10 ranking. 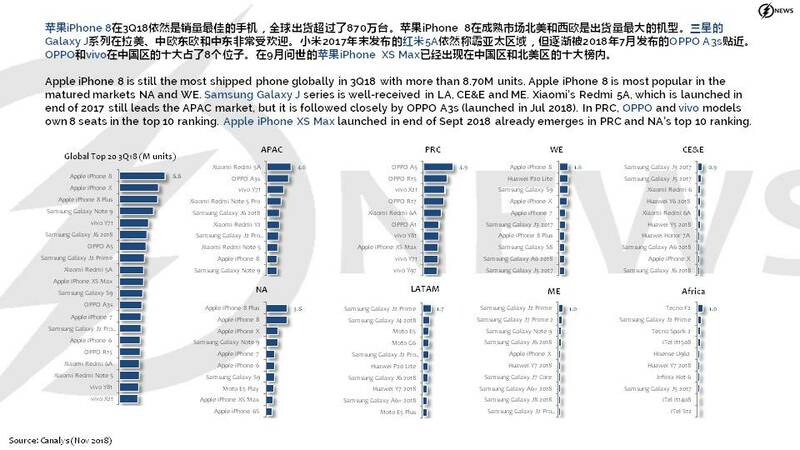 Apple iPhone XS Max launched in end of Sept 2018 already emerges in PRC and NA’s top 10 ranking. 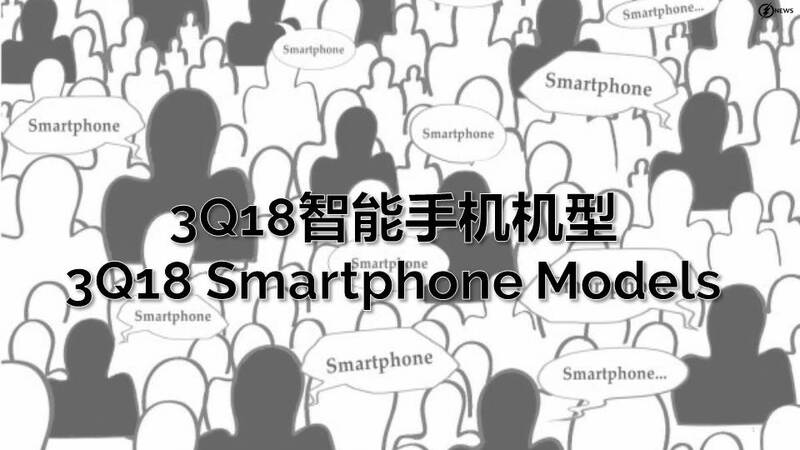 Redmi 5A still leads the entry segment of below $100 in 3Q18, yet its position is believed to be replaced by its successor Redmi 6A in next quarter. 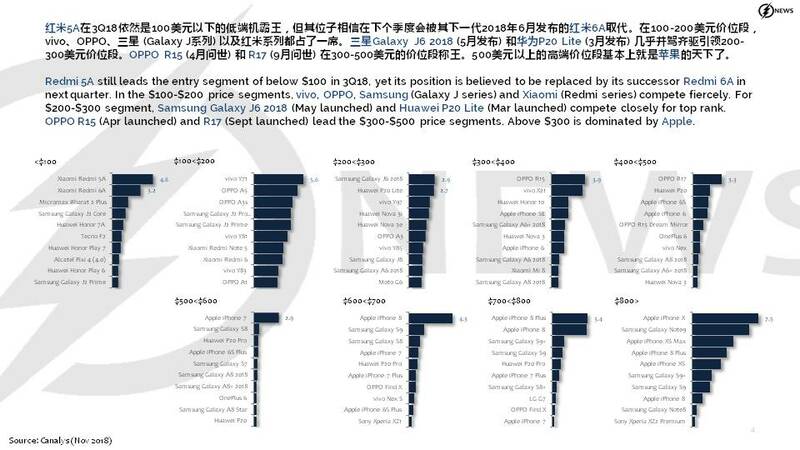 In the $100-$200 price segments, vivo, OPPO, Samsung (Galaxy J series) and Xiaomi (Redmi series) compete fiercely. For $200-$300 segment, Samsung Galaxy J6 2018 (May launched) and Huawei P20 Lite (Mar launched) compete closely for top rank. OPPO R15 (Apr launched) and R17 (Sept launched) lead the $300-$500 price segments. Above $300 is dominated by Apple. In- / Under-display fingerprint technology adoption is gaining traction in 2018. According to Sigmaintell, global shipments of in-display fingerprint sensors are expected to top 42M units in 2018. 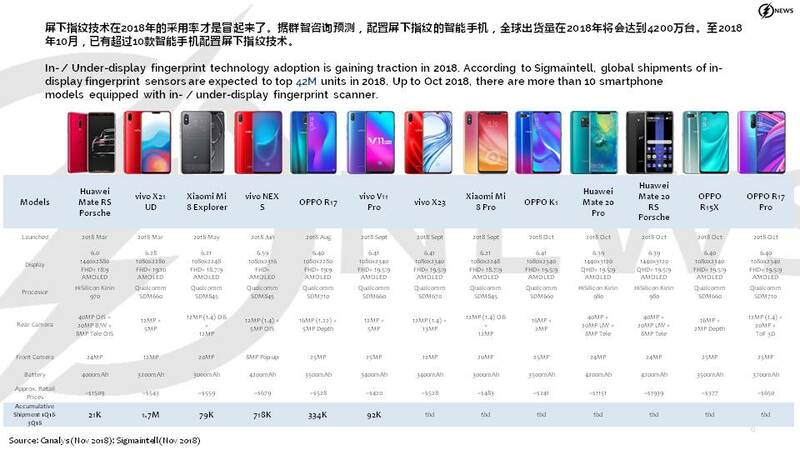 Up to Oct 2018, there are more than 10 smartphone models equipped with in- / under-display fingerprint scanner. GF Securities forecast that in 2018 global shipment of tri-cam smartphone will reach approximately 14M units (about 1% of the penetration rate). The penetration of tri-cam smartphone in 2019 would reach 15%, and in 2020 it would reach 25%. 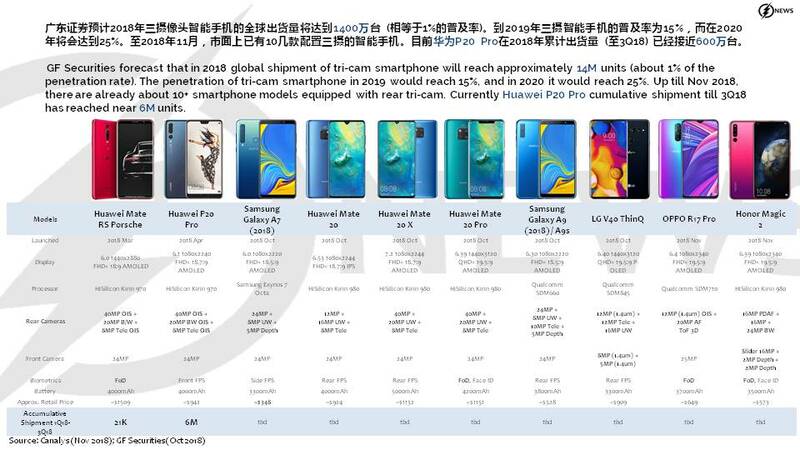 Up till Nov 2018, there are already about 10+ smartphone models equipped with rear tri-cam. Currently Huawei P20 Pro cumulative shipment till 3Q18 has reached near 6M units. 11-13: Intel has announced the Intel XMM 8160 5G modem; Xiaomi, Lenovo, Meizu, Alibaba’s Tianmao, JD.com Singles’ Day results; etc. → ← 11-11: Samsung Electronics will produce over 1M units in initial stock for its upcoming foldable phone; Samsung is allegedly developing a new Galaxy M line-up of phones; etc.